The drug is the dried root of Hamamelis mollis Oliv. 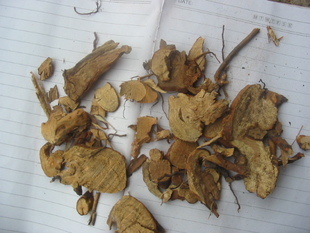 (family Hamamelidaceae), growing in shrubs and woods, on valley sides and wood-sides, distributed inSichuan, Hubei, Anhui, Zhejiang, Jiangxi, Guangxi of China. It contains kaempferol, quercetin, astragalin. It is used to clear away toxic heat; for the treatment of overstrain, severe sores. Decoct 15~30 g, or 60~90 g of the fresh.